**Disclosure: Free tickets were provided to help facilitate this feature. All opinions are 100% my own. This past weekend, we decided to get out of the heat and visit the DISCOVERY Children's Museum here in Vegas. We've lived here for about four years and have not yet had a chance to get over there, so figured we'd get the kids out for a bit and check it out. DISCOVERY Children's Museum at Symphony Park in downtown Las Vegas provides the perfect setting for children and families to learn something new and have fun doing it. My kids are ten and twelve. When we first walked in, I think they were very apprehensive as 95% of the kids there were under ten. While I do believe it is geared toward younger children, there are still plenty of learning to do for older children as well. The museum addresses its core educational areas of science and nature, art and culture and early childhood development with 26,000 sq. ft. of interactive hands-on exhibits. With featured traveling exhibitions, daily programs, demonstrations and activities and collaborative cultural programming for all occasions, it all adds up, with lots of informal learning opportunities. DISCOVERY Children's Museum's current traveling exhibit is Dinosaurs: Land of Fire and Ice. Kids get to travel back in time to when dinosaurs last roamed the land. As you move through the exhibit, you encounter unfamiliar landscapes, touchable dinosaurs of all shapes and sizes including a Tyrannosaurs Rex and a Triceratops. 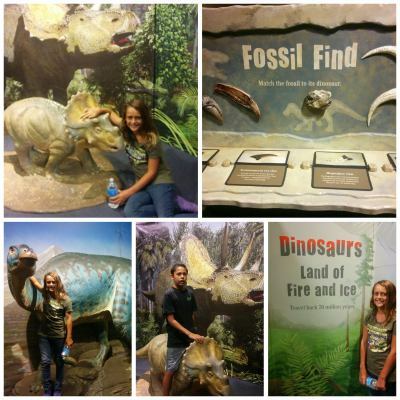 This exhibit builds on the popular fascination with dinosaurs and includes science activities to challenge all ages and opportunities to investigate what dinosaurs left behind. Given the age of my children, we were in and out in under two hours. I do highly recommend visiting for children under ten years of age. The little ones would be occupied for hours! A great way to get out of the house and stay out of the heat! 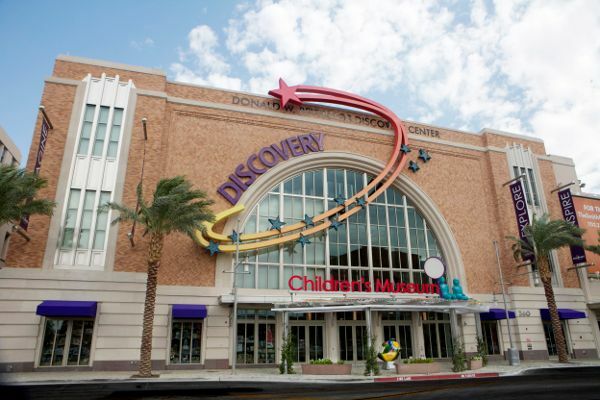 Enjoy 20% off General Admission Tickets throughout the summer at DISCOVERY Children's Museum. Explore the museum and see the Dinosaurs! Discount is good only for daily admission tickets for a party up to four (4) tickets per coupon. Not valid with any other offer.